I couldn’t have asked for a better weekend than the one I had at Graceland just prior to Elvis’ birthday! It has taken me so long to write about it because once I write about it, I know it is actually over. Anyway, I splurged and got the VIP My Friend Elvis Package which included a cocktail party with Jerry Schilling, a dinner with Jerry Schilling, a show and tell with Jerry Schilling, a tour of Graceland with Jerry Schilling, a movie screening with Jerry Schilling, two nights in a suite at the Guest House and a pass to Elvis Presley’s Memphis for two days. I would only get a package like this if it was with Jerry Schilling or Lisa Marie Presley. This weekend went exactly as I had planned and far exceeded my expectations! Since I couldn’t stay through Elvis’ birthday and attend the actual birthday events (because I had to get home for my dogs because I had no one to stay with them), I went to Memphis a day earlier than the Jerry Schilling My Friend Elvis Package started. Although I swore I would never fly again, I flew again. Since I was only going to be in Memphis for three days, it seemed sort of silly to drive 3 days to be there just for 3 days. Plus who knew what the weather was going to be like in January. Luckily I had enough points for a free flight, and I got a great deal on a rental car. I arrived in Memphis Friday January 4th at 10am cst wearing my blue “You’ll Never Walk Alone” Jerry’s Girls for E.P. shirt (the photo my painting was made from and the photo Jerry’s used on the cover of his book). I got my rental car, checked into my TCB suite at the Guest House, unpacked and had lunch at EPs Bar & Grill. For my first meal of the weekend, I got the fried green tomato and pimtento cheese sandwich, sweet potato fries and sweet tea. It was SO good and my first meal of the day – and I had been up since 4:30am est. After lunch, I went back up to my suite and watched Frankie and Johnny (there is a lot of Jerry Schilling in that one!). I fell asleep for about 15 minutes, which was just enough to get me refreshed for the night. Around 4:30, I left for the Grizzlies game. My plan was to hang out on Beale Street, but it was rainy and cold, so I went directly to the FedEx Forum instead because I remembered there is a bar inside the lobby that opened before the game. The doors at FedEx Forum opens at 5pm, but you can’t get into your seats until 6 and the game starts at 7. After waiting in line for about 5-10 minutes, I made my way inside to the Bud Light Bar & Grill. I had sweet tea and Memphis Sweet Potato Fries, which were sweet potato fries topped with sour cream, pimento cheese and bbq pulled pork – SO good! I was in my seat seconds after the gates opened at 6pm – the same seat I was in the last time I was at the Grizzlies game in Memphis (back in 2016 for the grand opening of the Guest House). It is a great seat in the front row behind the basket next to the Grizzlies tunnel and diagonally over from the Grizzlies bench. Unfortunately, the Grizzlies lost but I had a great time thanks to the fun (and funny) fans around me. And at least I got to see Chandler Parsons one last time before he left the Grizzlies – he didn’t play so I saw him on the bench, but I still got to see that beautiful face! I was back at the Guest House by 10pm. I didn’t even take my stuff up to my suite – just went to straight to the lobby. I hung out with Caroline, Nannette, Laurie and Tom – and made a new friend in Laura. Rob, the piano guy, sang “Sweet Caroline” for Caroline. I got my free peanut butter and banana sandwich from the peanut butter bar, took my seat facing the front door (but on a couch at a respectable distance away) and waited for Jerry Schilling to arrive. At the stroke of midnight, I saw that unmistakable hair through the outer door. In walks JERRY SCHILLING, followed closely by his wife Cindy (who I really wanted to hate but she is so nice I just love her!). I started shaking, my stomach flipped, I was short of breath and started repeating a little too loudly I’m afraid, “THERE HE IS! THERE HE IS! THERE HE IS!” while pounding on Laurie’s leg because no one else was seeing what I was seeing (there were only seven of us in the lobby). Jerry’s wife looked in my direction and was smiling, so I don’t know if she actually heard me or it was just a coincidence. Jerry headed straight toward the front desk to check in. They headed up the North Tower where I was staying. I was back up in my suite by 12:30 or so. Extremely pleased with my first day and excited about the next days to come. If you want to know why I was SO excited to see Jerry Schilling and why I indulged with the VIP package for this weekend, please click here to read all about my love for Jerry! To see all of my photos from today, please click here. Around 11:45am, I went to Marlowe’s for Sharon Parker’s MeetUp at noon. I sat in the Elvis room at my favorite booth – the one with the brightly colored painting (screening) of Elvis. I was starving, so I quickly ordered the yummy fried gouda sticks, sweet tea and the bbq brisket with green beans and mac and cheese. Sharon’s special guests were Louise Smith (and of course I didn’t have my Gene Smith book with me for her to sign as I did during Elvis Week when she wasn’t able to attend), Danny and Joey Smith, Bardahl and Rose Clayton (whose first book I read and she told me about a new book about Elvis and the police). I talked with Caroline, Marr, Sylvain, Bobby Sue, Toni and Holly. I checked Marlowe’s gift shop to make sure they didn’t have any books I needed, and they did not. While I was at Jon Daly’s Elvis Birthday Bask and Sharon Parker’s MeetUp, Jerry Schilling (according to my dad who was listening at home) was on Elvis radio talking about when he first met Elvis and the upcoming events saying he was really looking forward to the Elvis on Tour screening. Just before 2pm, I went over to Elvis Presley’s Memphis because I got a pass with my Jerry Schilling package. I immediately went to see the new Presidential Medal of Freedom Award and watched my favorite Jaycees’ speech since it was right next to the new award. Then I went to the movie display and watched the reel of all the Elvis movie clips as I do every visit because I absolutely love the Elvis movies! I was standing outside of Vernon’s by 3:45 for the Cocktail Party with Jerry Schilling at 4pm! I was so excited and nervous I did not eat one hors d’oeuvre, but I did have one small glass of white wine, which was sort of a mistake because that just made me sweat and get red faced as wine often does to me. Jerry walked in around 4:15pm. Caroline, Laurie and I were at a stand up table at the other side of the restaurant. Jerry walked through the room mingling, talking, taking photos and signing autographs. He walked back almost as far as we were then turned around. So we were forced to go up to him. It was Tom Brown’s birthday, so I wished him a Happy Birthday and then asked him if he ever told Jerry about Jerry’s Girls (because during Elvis Week Tom interviewed me wearing my Jerry’s Girls shirt and said he would tell Jerry). Tom said, “Oh I’m sure he knows.” (This didn’t make sense at all because Jerry come to find out, Jerry did not know.) Tom said he would introduce us to Jerry. Tom went up to Jerry and told him about Jerry’s Girls and our shirts etc and Jerry laughed. Then I walked up to Jerry and when I started explaining about our shirts and our chat group etc, Jerry laughed and said, “I thought Tom was kidding.” Jerry said, “Oh like Jerry Lewis,” and I told him that is where I took the name from. (See how Jerry and I think alike.) Jerry asked us if we had the shirts, and Caroline told him we debuted them during Elvis Week, then I said I designed three other shirts. Jerry asked if we would be at the events tomorrow, and I said yes we’ll be wearing our shirts. A little while later Jerry gave Tom the head nod indicating it was time to leave. I asked Angie if I should follow to go to the dinner now, and she said to wait a few minutes then come over. At 5pm sharp, I made my way over to the Hollywood Backlot for the Private Dinner with Jerry Schilling. When I arrived about half of the others were already there, but no one was sitting. I quickly noticed that Tom, Jerry and Jerry’s wife Cindy were seated at the head of the table, which was set up like a horseshoe. I asked one of the waiters if we were allowed to sit down, and he said yes. So I quickly made my way over to the seat at the end closest to the head of the table, so I was next to Tom Brown who was next to Jerry. I thought that was my best shot at getting a conversation going with Jerry. The table was already set with salad, banana pudding, tea, water and an empty wine glass. Once I sat, everyone followed. I made a friend in Sandy who sat next to me, with her adult daughter sitting on the other side of her. There were about 20 or so of us. The wine was served, and it kept flowing and flowing. Tom came out first and introduced Jerry at the open end of the horseshoe, which was the far side from me. Jerry told a story about an Elvis Birthday – one they spent in Vail with Linda Thompson. Jerry, Tom and Jerry’s wife took their seats, then we were told to eat our salads. It was awkwardly quiet. It was as if no one knew if they were allowed to talk or if they were allowed to talk to Jerry. Jerry and Tom were talking though, and I was trying my best to hear what they were saying. It was clear they were enjoying each other’s company and were having fun. In fact, I heard them both say how much they had missed each other. They also talked a bit about Jerry’s house that Elvis had given him and what, if any, improvements he had made to it. I also heard Jerry telling Tom how much worse TCM is now Tom has left. The main course of chicken pieces, bbq brisket, green beans and macaroni and cheese were brought to the tables family style. As Angie was helping to bring out the food, Jerry joked, “Hey Angie, I didn’t know the food was from the archives.” Everyone laughed, reminding me when Elvis would make a joke and all the guys would laugh. Tom chimed in, “Get out the white gloves.” This sort of broke the ice (or maybe it was the continuous filling of our wine glasses) and everyone started talking to each other, but still no one but Tom talked to Jerry. At one point, the waiter apologized for interrupting Jerry and Tom and asked if he could refill Jerry’s wine glass, and Jerry said you never have to apologize for bringing me more wine. (Jerry drinks red wine for those who are interested.) Tom turned to me and asked if these were assigned seats or did I plan this (with a mischievous look on his face that said how did you get this seat closest to Jerry)? I told him no they were not assigned seats, and yes I purposely sat here in the best, closest seat as I was the first to sit down. By this time, Jerry was looking over and listening to us. Then Tom asked me when I bought these tickets because they sold out so fast. I said I bought them the second they went on sale, then looking at Jerry I continued, “because I enjoy Jerry.” This made both Jerry and Tom laugh. Then Jerry told his wife Cindy about Jerry’s Girls and our shirts and how he thought Tom was joking at first. Cindy said, “Oh like Jessie’s Girl.” I told them we have shirts with four different designs on them. Cindy seemed very excited. Jerry told her we would be wearing them to the events tomorrow. Then Jerry said something to Tom like ‘You know who would think this was funny? ELVIS! He would really laugh at this. Little Jerry Schilling has fans.’ Tom got a big kick out of this, as did I! Then Tom said Jerry’s wife should have a shirt that says Jerry’s Girl, and I said I could make her one. She and Jerry immediately said, “Yes please!” Around 5:50pm, Jerry gave a quick thank you speech. As they were leaving Cindy said to me, “Keep doing Jerry’s Girls,” and I told her I would show her the various shirts tomorrow. After the dinner, I went back to the Guest House, changed back into my Jerry’s Girls shirt and hung out with everyone in the lobby successfully scoring another peanut butter and banana sandwich from the free peanut butter bar. I did see Jerry and Cindy in the lobby, but decided not to go up to them. To see all of my photos from today, please click here. The next day, Sunday January 6th (exactly one month before Jerry’s birthday and it is exactly one month later I am writing this), I woke up very excited for Day 3 with Jerry Schilling. Even though I was guaranteed front of the house seating for the Jerry Schilling Me and a Guy Named Elvis Show and Tell, which didn’t start until 9:30am and doors didn’t open until 9:00am, I still went down to the Guest House theater at 8:30am wearing my black Jerry’s Girls for E.P. shirt (the original photo we used for our Jerry’s Girls chat group). I secured my front row center seat in front of the screen and stage where Jerry Schilling, Tom Brown and Angie Marchese would be seated sharing archives from Jerry’s life with Elvis. It was a great hour! They talked about playing football with Elvis and showed us Elvis’ jersey. They talked about their visit to the White House and meeting President Nixon and showed us souvenirs the President gave them as well as the check from to the Beverly Hills Hilton where Elvis flew in to get Jerry before they flew to DC. They showed us the photo of Jerry and his first wife Sandy and Elvis and Priscilla standing in the Meditation Garden. They talked about and showed us the gun that Jerry gave Elvis. They talked about Elvis on Tour and the Karate film Elvis wanted to make. Jerry left the stage and after I realized he wasn’t coming back out, I walked over to his wife Cindy to show her my Jerry’s Girls shirt. She loved it! I also showed her a photo of four of us wearing the original shirt last year at Elvis Week. Cindy was very excited. I asked her if she wanted me to make her one, and she said yes. I asked Cindy which one she would like, and she told me to choose one. Caroline had joined us and asked Cindy how should we get the shirt to her, and to my surprise Cindy just gave me their address. (I mean I know you can google it, but still.) And this is the same house that Elvis gave Jerry over 40 years ago! I had lunch at EP’s (the pimento cheese dip and chips, the delicious fried chicken wedge salad and sweet tea) then went up to my suite to relax for a bit. I was back down in the lobby by 2pm for my 3pm TOUR OF GRACELAND WITH JERRY SCHILLING!!! We were supposed to meet out front of the Guest House at 2:45pm. I thought maybe Jerry would ride the shuttle over to Graceland with us, but he did not – and neither did Angie. They came in an SUV behind us. Graceland closed to the public at 2pm, so we were the only ones there. We departed the shuttle and lined up outside to wait for Jerry to arrive, so we could get our photo with him in front of Graceland! (Are you kidding me?! Is this real life?!) I of course was first in line. I walked up to Jerry and showed him my shirt, and he loved it. He immediately shouted, “ANGIE look at this shirt! I thought Tom was kidding.” Then I quickly showed Jerry the photo of Jerry’s Girls in our shirts from Elvis Week, so he didn’t think I was the only one. Robert took our photo, and I thanked Jerry then waited for everyone else to get theirs. We walked up to the front door of Graceland and Angie and Jerry stood on either side of the door, and I stood right next to Jerry. After Angie was finished speaking, Jerry opened the front door with me directly behind him. I walked to the far side of the foyer though when I got in. Jerry stayed near the door facing the staircase. As soon as he entered (before everyone was even inside), he looked at Angie and said, “It still feels the same.” Then to himself he said, “comforting.” I almost cried. 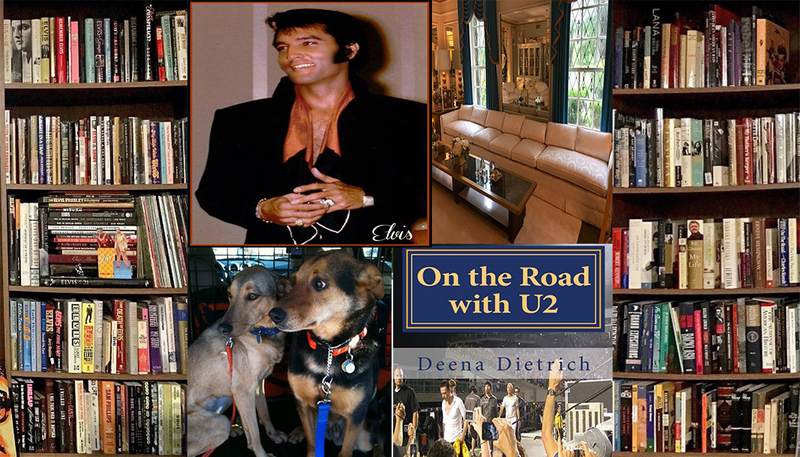 I obviously didn’t live in Graceland like Jerry or even spend time there like Jerry, but I have always found Graceland very comforting – a sense of peace always washes over me as soon as I walk through that door. 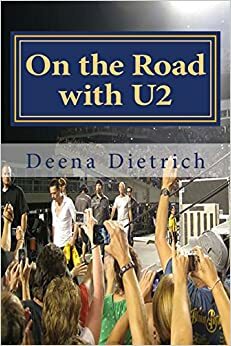 There was about 10-12 of us on the tour as well as Robert the photographer, a videographer, Jerry, Angie and that was it – no other workers. It was amazing! Jerry told a few stories in the foyer. He told of his first time at Graceland (in 1957), and Uncle Vester called up to tell them Jerry was there and Jerry had this huge smile on his face when he mentioned Uncle Vester. Jerry said while Elvis’ mother was still alive, they had their parties in the basement. Jerry said there were two “indelible memories” he had in the Graceland foyer. The first was when Elvis came back from the army, Jerry went to Graceland and didn’t even know if Elvis would remember him. But as soon as Jerry walked in the door Elvis had him helping with a Karate demonstration where Elvis almost kicked Jerry right between the legs. The second was when Jerry walked into the living room / music room and saw Elvis by himself playing the piano and singing “You’ll Never Walk Alone” and just winked at Jerry. (That is the title of the Joe Petruccio painting of Jerry and Elvis I have and how Jerry ends his book.) Jerry mentioned how, no matter what, every time Elvis left the house, he went back and spoke to his Grandmother Minnie Mae aka Dodger. Jerry called her Grandma. Everyone went to see Minnie’s room, but I stayed and stood at the living room by myself for a few moments as it is my favorite place. Then we as a group went to the kitchen, not stopping in the dining room. I followed right behind Jerry and stood right next to him. Angie talked for a bit and showed us where Lisa Marie had signed her name in the drawer, and Jerry had no idea. Jerry seemed to really love the kitchen. He said it was where those who lived at Graceland spent most of their time. Jerry’s eyes just lit up when he talked. He said Pauline was his favorite. Then we went downstairs. Jerry stood across from his old room leaning against the bar. He said Elvis’ Gold Records used to line the ceiling and walls in the basement, and Jerry loved walking out of his room and seeing those records. He said his first mistake when living at Graceland was he found one of the old Tommy Dorsey shows, which was his favorite, and played it. Then Elvis shouted down, “Who put that crap on?” So Jerry learned never to play Elvis’ movies or songs when Elvis was in the house. Someone asked about the mirrors on the basement ceiling, and Angie said it was to make the rooms look larger then someone joked ‘oh that wasn’t so Jerry could come out of his bedroom and look at himself’ and Jerry responded, “No that was in the bedroom” and everyone laughed. Jerry said there was a bed and a couch and a board (for when it flooded) in his bedroom in Graceland. I asked if we could look in Jerry’s room. Jerry seemed like he was all for it, but said, “That’s up to Angie” to which Angie replied, “No” because it was all storage. She went on to say that his room isn’t right there. It is a little hallway then turns to the right (behind the fireplace) and that’s the actual bedroom. From there we went into the pool room, where I stood right next to Jerry but I can’t remember any stories he told – maybe Angie just talked. 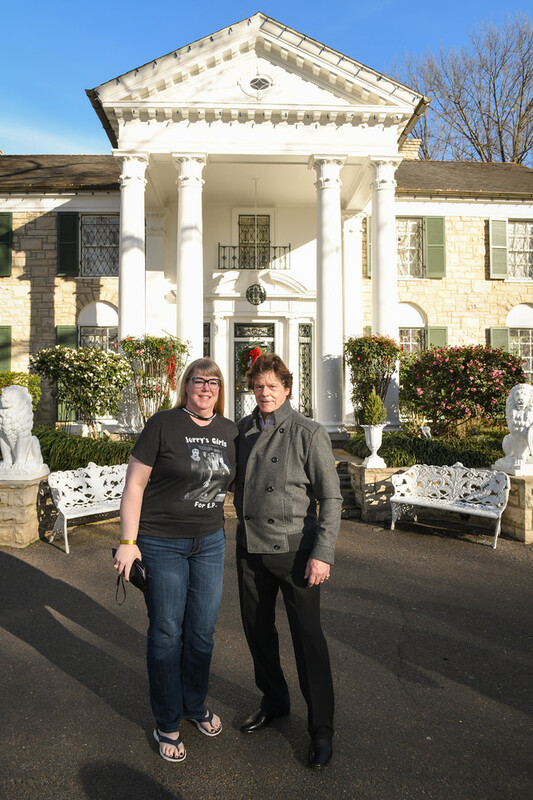 By the way, I was obviously excited about Jerry touring us through Graceland but it was also amazing to have Angie touring us and hearing everything from her. We then walked up stairs to the Jungle Room. I was one person back from Jerry going up the stairs. Jerry stood on steps at the kitchen door, and I stood one person away from him. Jerry told how the Jungle Room used to be a porch, and how he remembers getting Lisa’s chair delivered through the window, and when the Hawaiian furniture was delivered and how they used to have 43 horses so they moved them to the Circle G Ranch. After the Jungle Room, Jerry went to the carport to set up for our autographs. We received an 8×10 glossy of the photo we took in front of Graceland and Jerry was to autograph them for us. This time I was toward the end of the line. I walked up to Jerry, and he smiled, laughed and said, “I keep looking at your shirt” – still in disbelief that he has fans. (I had noticed during the tour, he would look at me and kind of do a double take – I guess he wasn’t used to seeing his name and face on a shirt). I told Jerry I spoke with his wife, and I was sending her a shirt and he said, “Oh wow that’s great! Thank you!” I asked Jerry to please sign the photo to Deena. I thanked him for doing this, and Jerry said he’s had a great time! And this was obvious to me because Jerry had been happy and laughing at all the events – and he seemed truly appreciative of the fans. At first I was disappointed I had the first tour of Graceland with Jerry (as there were two), but I was glad to be there the first time he went through the front door of Graceland and told his stories – Jerry’s emotions were more raw than they would have been on the second tour. After the autographs, Jerry and Angie left us and DeeDee from Archives escorted us through the rest of the buildings. She was not really telling us any stories or anything we didn’t already know, so after Vernon’s office (which I love) I blew through the Trophy room and went ahead to the Racquetball Court and then onto the Meditation Garden, which I had all to myself for several minutes until the rest of the tour caught up to me. It was absolutely beautiful with the sun setting and tranquil with the sound of the fountain – and it was a balmy 60 degrees in early January! Around 5:30pm, I had dinner at Delta’s (in the Guest House) sitting in a half circle booth by myself pretending I was at one of Elvis’ shows in Vegas (those half circle booths always remind me of that). I had THE best dinner – the fried green tomatoes appetizer and the Campanelle Pasta and THE best sweet tea! At 6:30pm, I went back to the Guest House theater where I had started my day for the Viva Las Vegas Sing-Along at 7pm. I sat in the front row on the aisle right in front of the podium that was set up for Jerry for the Elvis on Tour screening at 10pm. People did actually sing to most of the songs during Viva Las Vegas. It was fun, but I agree with the Colonel there is WAY too much Ann-Margret in that movie! It was over at 8:30, but I stayed and talked with Nannette (whom I had met at the opening weekend of the Guest House back in 2016 and seen at the past two Elvis Weeks) for an hour. By that time, everyone started filing in for the Elvis on Tour screening at 10pm. Sandy, my new friend who I sat next to at the Jerry Schilling dinner and hung out with at the rest of the events, came and sat and we talked until all of a sudden Jerry walks in – with no introduction. Jerry talked for about six minutes about the making of Elvis on Tour and about the documentary on the making of it we were about to see called Standing Room Only. Then he thanked everyone for a wonderful weekend. Jerry took his seat next to his wife, several rows behind me, but only stayed for the Standing Room Only documentary – not for Elvis on Tour. I wonder if it was just too much for him? I can imagine it must be pretty emotional, or maybe he was just tired from the day’s events. Exhausted from the day, I only hung out in the lobby for a half hour then was back up in my suite by 1am. To see all of my photos from today, please click here. The next morning Monday January 7th I awoke sad because I had to leave, but thankful for such an amazing weekend. I went down to the lobby around 9:30am and saw everyone in line for the Brunch – the first of the actual Elvis Birthday events. I talked with Sandy and then Caroline and then left at 10:30 for the airport. I was home to my dogs by 4pm est. The next day was Elvis’ Birthday, and I watched the proclamation online and was relieved I hadn’t missed anything at the cake cutting ceremony as there were no Elvis VIPs in attendance. I celebrated Elvis’ birthday as I usually do with an Elvis movie / documentary marathon watching all of my favorites. It took me a good week to fully emerge from the Elvis bubble and get back to reality. I ordered Jerry’s wife, Cindy, two of the Jerry’s Girls for E.P. shirts I designed – the black one with Jerry and Elvis walking and the dark blue “You’ll Never Walk Alone” one. I wrote a card to Cindy thanking her for sharing her husband with us and being so nice to us and allowing us to send her these shirts, and I signed it from all seven of us Jerry’s Girls. I included a photo of four of us in our Jerry’s Girls shirts from Elvis Week. I also wrote a long letter to Jerry telling him everything I have ever wanted to tell him about why I like him – and included my email address just in case he wanted to email me a response. I mailed this package with the shirts, the letter, the card and the photos and about two weeks later (this past Saturday) I was stunned to find a very thick envelope in the mail with the return address Jerry and Cindy Schilling! Not only did Cindy take the time to send me/us a thank you note and a couple gifts, but she took the time to personalize them. She addressed the envelope to me and Jerry’s Girls. Cindy decorated the front of the card with each of our names and added her own and at the bottom put “Elvis” Jerry’s Girls. Inside the card on the left, she wrote, in different colors, all of our names and added her own and wrote, “I wish they all were Jerry’s Girls.” On the right side of the card, Cindy wrote “I love that my Jerry has a Jerry’s Girls fan base. Cuz I think he’s pretty special too … (I love the shirts) Big Hugs, Cindy.” Included was a photo of Jerry and Cindy from the Guest House printed Love, The Schillings, and on the back Cindy wrote, “Deena, Thank you so much for the Jerry’s Girls T-shirts!! !” Hugs, Cindy Schilling. Also included was an Australia shaped collector’s pin “Direct from Graceland Elvis Live 2017” – Jerry did a tour of Australia a while back. I am truly touched by this gesture and cannot wait to get a photo with Cindy in her Jerry’s Girls shirt the next time we’re in Memphis for an Elvis event! As I mentioned, it has taken me a month to write this account of my wonderful weekend with Jerry Schilling – it was more than I could ever hoped it would be. And although we are all sad after learning about the passing of George Klein last night, today is Jerry Schilling’s birthday so it is only fitting I publish this in celebration because we need a little joy today. Thank you so much for writing this blog, now I think I’m going to reread it one more time tonight so I can soak it all in. Thanks again for making us all part of the experience…a experience of a lifetime. Happy 77th Birthday Jerry! Thank you so much Julie! It was an unbelievable experience that I almost don’t believe it happened. And about Jerry not knowing about Lisa’s signature in the drawer, he even leaned forward to look inside.